Now located at the new Dosher Wellness Center, Cardiac Rehab is an exercise and health program designed for anyone who has suffered from a heart condition. The program includes a combination of monitored exercise and educational sessions to increase your strength and help you return to a healthier lifestyle. Participants attend 2-3 sessions each week up to 36 sessions, typically 12 weeks. 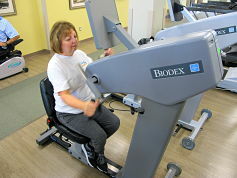 The program is tailored to fit your individual needs to ensure you gain the most benefit from cardiac rehab. Program components that will be part of your treatment plan include exercise, nutrition counseling, and stress management. Trained cardiac rehab staff will provide continuous EKG monitoring and health assessment throughout the exercise sessions. How can Cardiac Rehab help? 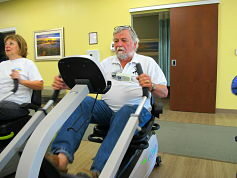 Cardiac Rehab is on the first floor of Dosher Wellness Center, 3009 Medical Plaza Lane, Southport. This is south of Route 211, just off Middleton Boulevard. For more information, call 910-457-3871.